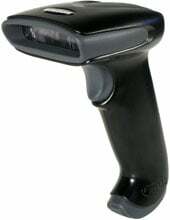 Honeywell Hyperion 1300g - SCANNER ONLY, 1D Imager. Color: Black. Cables and accessories must be purchased separately. For the full kit purchase (Part# 1300G-2USB). The Honeywell Hyperion 1300g delivers outstanding linear imaging performance and versatility. Fast intuitive barcode reading out to 18 inches (457 mm), and high density barcode reading are both enabled in a single device, eliminating the need to purchase specialty scanners. With no moving parts to wear out, the Hyperion 1300g is one of the toughest general duty scanners on the market. Designed to keep your operation running smoothly, the Hyperion 1300g is durable enough to hammer nails. These little scanners are one of the toughest available. They are tough enough to handle the assembly line in a manufacturing facility where they get dropped and tossed about. We have been using these since they were Welsh-Allyn and I'm sure many are still out there working. The Honeywell 1300G-2 is also known as HHP-1300G-2	or 1300G2	.